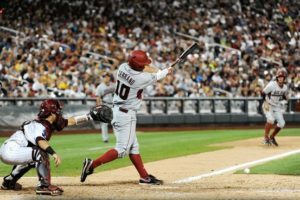 How to Get Recruited for College Baseball – Can Anyone Do It? For parents of children who have demonstrated real talent in baseball, the time to start thinking about recruitment by colleges or universities starts well before the senior year of high school. In fact, for baseball players the most important year may be their junior and sometimes their sophomore season. This is because most college and university baseball coaches will have filled their recruiting class early due to the overlap in baseball seasons. It’s also not uncommon for college baseball coaches to get verbal commitments from high school sophomores. 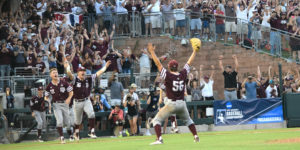 So, your senior year in baseball, barring either a major setback or outstanding play, will have little to no effect on your chances for getting recruited. In fact, most players will have to submit their college applications even before their senior season begins. One issue that college baseball coaches face is the Major League Baseball draft. Because drafting a prospect can change everything in terms of what college baseball coaches where hoping to get, it means that your son will have to demonstrate their talents during their sophomore year in high school. Otherwise, showing their skills in their junior and especially senior year is probably too late in terms of highly competitive conferences. A wild card in all this is the junior college or JuCo players who may transfer to the four-year schools if their MLB prospects do not work out. However, most baseball prospects will not be drafted by the MLB, it’s just that college baseball coaches have to be prepared. The key to being recruited by college baseball coaches is getting your name and abilities out there to help them see who you are and what you can do for their team. If you are looking to improve your chances at getting recruited, Sports Force can help as the platform necessary to get you noticed by colleges and universities around the country. We provide several programs to promote your abilities so that baseball coaches take notice. It all starts with an evaluation of talent, providing video of playing high school games, participating in camps that baseball coaches attend, and proper promotion that puts your name above the rest. For parents who want to give their child the best chance to succeed in getting recruited by good schools, SportsForce offers the means to get them where they belong. Sports Force can help you create a list of schools to target which is best suited for your child. Then, we focus our efforts to ensure maximum exposure so that your son will have the best chance to live their dream of playing college baseball and getting a scholarship. SportsForce also brings our unique experience that can provide options that you might not have considered such as the types of schools that may be best suited for the talents of your child. You will still need to start early to stand the best chance of being noticed by college baseball coaches, so check out what Sports Force offers and see why they make a big difference in turning prospects into college baseball players. Get a free evaluation by clicking on the link above. High School Sports Recruiting Services – How Do You Know Who To Trust? Unfortunately, the college recruiting process is not a predictable one as many coaches use their own criteria to fill the needs of their team. So, while you may try your best to get your name and abilities out there for the coaches to see, the final decision will rest with them on who they choose to provide scholarships. For parents and their children looking for the right college or university, it pays to look at the big picture, then narrow down the options over time. Too many will start with a shortsighted perspective and try to expand from there, which normally works against getting a scholarship when the original choices are gone. Putting all your eggs in one basket works against your interests primarily because of the unpredictability of recruiting. Recruiting for colleges is a fluid, ever-changing process that often changes the perspective of how a high school athlete is viewed over the course of two to three years. In addition, coaching changes at universities are frequent as well. This means that an athlete who was highly prized may be forgotten as the new coach takes over. Another issue is the opinions of those who may be a part of the recruiting process who may advise you and your child that the chances of getting a scholarship are not worth much until the offer is presented. You should never put much faith in what anyone tells you until the scholarship has been offered. Plus, focusing on what one coach says may cause you to miss out on other opportunities that may work out better in the long run. The unpredictability increases with the lack of knowledge parents and their children have about the colleges and universities themselves. All schools that are worth serious consideration should be thoroughly researched so that their recruiting strategies are understood. For example, a coach will recruit athletes that best fit the system they have created. If your talents are not normally part of that system, then your chances are diminished in terms of getting a scholarship. You can avoid putting all your eggs in one basket by getting SportsForce on your side. 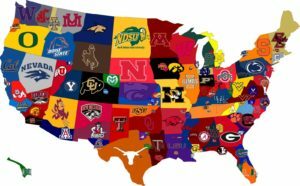 We provide the resources you need to help your child get recruited by colleges and universities around the country. In a nutshell we maximize the chances of your son or daughter getting a college scholarship that pays for their higher education. We help you see the big picture with all the possibilities to consider then narrow down in the right manner. The knowledge, experience, and talents that SportsForce brings to the table means that your child stands the best chance of getting selected by the appropriate college or university. SportsForce offers a complete line of services designed to get the attention of college coaches so that your child will have their name, abilities, and potential placed front and center for consideration. While there are no guarantees in getting your child a sports scholarship, having SportsForce on your side increases the chances far above the normal recruiting channels that are available. Get a free evaluation from an expert HERE. Getting recruited for college teams can be a trying time for young high school baseball players. This is true for those who play during the summer under the watchful eyes of college coaches and professional scouts as they only come around during certain times of the year. So, making the most of the moment is crucial to success. So, how can a young athlete make the most of their opportunity to shine? While it comes down to performance, there are other attributes that need to shine as well so that you boost your chances of making a good impression. Not all your time during the summer will be spent playing. For most players, it will consist of several tournaments with a week or two with downtime in-between. During that downtime, it is important to stay in shape, recover from injuries, and take care of yourself so that you are playing at your best in the tournaments. This is where a strength training program can help considerably in developing muscles, increasing mobility, and working to make you a better overall player. It not only keeps you in-shape during the summer, but also prepares you to train for the fall and excel next spring when your team needs you. No matter the individual talent, it comes down to the success of the team that makes the difference. The more successful the team, the longer they will play during the summer season which means more opportunities to be seen by coaches and scouts. While it pays to have a great performance, it is better that the performance enhances the team’s chances of moving forward during the season. It’s still a team game, so play it to promote your team’s efforts to go further and that will help you in getting recruited. It may seem like the summer league is a time to relax and enjoy the game more, compared to the spring when championships are on the line. However, nothing could be further from the truth as the preparation and go-for-broke attitude need to be in place as if you were playing for the World Series each and every game. This does not mean that you should take it so seriously that it negatively affects your play, but instead that you should play each game as if it gets you to the championship event. Be prepared and it will show. Make sure you run with the same hustle, energy, and enthusiasm you had during the spring games. Scouts and coaches are trained to see the effort even if it doesn’t turn out to be your best game. To maximize your chances of being recruited by college and university baseball coaches, you will need the knowledge, talents, and skills of SportsForce by your side. SportsForce can maximize your opportunities to get recruited thanks to their unique programs, which help you create an effective tournament schedule, provide guidance in what to expect, and bolster your name and abilities so that scouts and college coaches take notice. Get a free evaluation by a professional recruiting advisor by clicking this link Here.